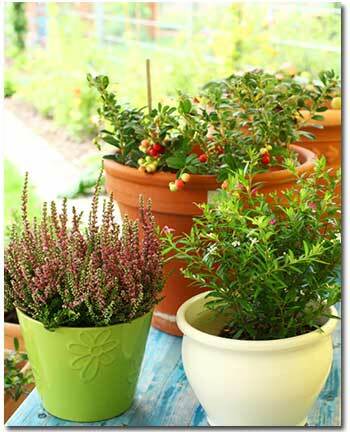 Plants in containers often suffer at this time of year. Water them frequently. (A drip system can save time plus all the water that’s wasted when you go from plant to plant with a hose.) In very hot weather, containers often dry out almost as soon as they’re watered. It’s not only the heat; dry air literally pulls moisture out of the soil right through the sides of terra-cotta pots. Terra-cotta containers add charm to gardens and patios, but unfortunately for aesthetics most plants actually grow better in plastic. The idea that plants are helped by a pot that “breathes” is a mistaken one. The soil mix itself should breathe. It should be light and airy, which can be accomplished by adding perlite or sponge rock. In containers that breathe, roots follow the water as it escapes through the sides of the pot. They form a solid mat that clings to the inside of the pot, drying out daily and causing the plant to wilt. When plants are grown in plastic, roots tend to form more evenly throughout the mix. Eventually they congregate at the bottom and along the sides, but by then it’s time to re-pot the plant to the next size. Before planting in porous containers, seal the insides with a double coat of black waterproofing tar to help prevent moisture from escaping. Alternatively, try double-potting. Just put the plastic pot inside one of the more attractive pots. (If you want to dress things up a little more you can hide the grow pot and soil by putting a layer of dried Spanish moss or bark chips on top of the soil at the base of the plant).